On New Girl Season 5 Episode 14, Jess is shocked to learn Sam has taken a restraining order out on her. Winston tried to make Jess realize she won't be able to overturn a restraining order and the only one who could do anything about it would be Sam. Jess is determined to get him to listen to her and make him realize she isn't dangerous. Jess decides to go to Sam's work and attempts to put a note on his car, but can't remember what he drives. When Sam starts to come out, she quickly jumps into the back of a truck which turns out to be Sam's. 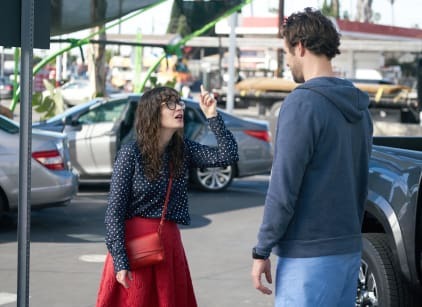 Jess tries to call Winston for help, but she loses contact with him when Sam decides to go through the car wash and Jess's phone gets ruined. Jess reveals herself to Sam and she tries to make amends with him, but he doesn't want to listen to her. He starts to feel bad for Jess when she reveals she has no way to get him and will have to walk there with her clothes soaking wet and he offers to drive her home. On their way back to Jess's place, Jess admits the only reason she keeps bothering Sam is because she can't get him off her mind. Sam, after hearing what Jess had to say, admits ever since he saw her he can't get her off his mind. The two start making out and decide to get back together. Meanwhile, Nick and Schmidt get into a war with a new bar owner named Connie. Unfortunately, Nick and Schmidt are the only two actually taking part in the war as Connie doesn't see them as competition. After a little back and fourth, Connie, Nick and Schmidt all decide to call a truce. You still have time to catch up before the season finale. Go watch New Girl online now via TV Fanatic anytime.